It is interesting how some places are overshadowed by similar attraction for no apparent reason. We think this exactly is the case of Laguna Paron, the largest lake in Huascaran National Park in Peru. But times slowly change, and travelers slowly discover the beauty of this incredibly blue lake. And what takes crowds away from Laguna Paron? It is the most popular one day trip from Huaraz - Laguna 69, the number one attraction for those who are in Peru for a short time and want to get a sense of the Cordilleras. But if you have one day to spare, you should give Lake Paron a try! To be honest, we found Laguna Paron as beautiful (if not even more beautiful) than Laguna 69. And no crowds there. From the shore of the lake, you can see many snow-capped peaks of the surrounding mountains, but one mountain stands our in particular. It is probably a mountain which everyone in the world knows by look, but doesn't know its name and location. It is the Artesonraju, a mountain depicted in the Paramount Pictures logo. Yes, that American Holywood film company. But back to the Laguna Paron. Laguna Paron sits in breathtaking 4200 meters above sea level. It is a great acclimatization hike for all who plan on doing more high altitude trips or multiday treks in Peru. If you do only one day hike to Laguna Paron, you should be fine - don't eat much, drink a lot of water and climb all the way up steadily. There is a shelter or camping spot where you can spend a night - in that case, it is better, to be well-acclimatized in advance as sleeping at this altitude can cause you lots of troubles without proper training. Laguna Paron lies about three hours drive north from Huaraz or about a two hours drive from Caraz - a smaller town where we decided to place ourselves for a couple of days instead of in touristy Huaraz. Laguna Paron lies in Huascaran National Park and more specifically in the Cordillera Blanca. Most people who hike in the Cordillera Blanca stay in Huaraz for a reason, it's a perfect base for one of the best day-trips in Peru, like Laguna Churup hike or Pastoruri Glacier. We arrived to Caraz from Trujillo, where we visited Chan Chan ruins and decided to stay in a smaller quiet town of Caraz. As we mentioned before, a small town Caraz can be a pleasant alternative to a touristy (and bit dirty) Huaraz. There are also several travel agencies which will help you organize one day or multi-day treks. We stayed in a cheap, but very nice hostel with a bit weird name Hostal y Restaurante Business Rosh. You can check other accommodation options in Caraz here. The entrance fee to Laguna Paron is only S/5. It is six times less than the entrance fee to Laguna 69! There is an office which opens at 8 AM, so buy your ticket here. Although Laguna Paron lies within Huascaran National Park, you don't pay the entrance to the national park, but only the contribution to the local communities. We started the hike earlier but met a collector on our way up and paid to him (took a picture of him just in case as he did not look very official though). In case you wouldn't find anyone, you can pay by the lake in a shelter or on the way back. You can visit Laguna Paron either from Huaraz, or from Caraz, it depends, where you stay, and you can either take a tour or travel independently. Each option has its pros and cons. With a tour | If you stay in Huaraz, visiting Laguna Paron with a tour is probably your only option as it takes about three hours to reach the lagoon and the public transport to Laguna Paron at the moment is not reliable because it is not that heavily visited. Tours start early in the morning, and the bus will take you directly to the lake (there is a road to the lake for those who don't want to hike). It means the only hiking you can do is a short walk on the lake's shore or climb to the viewpoint. The cost of the tour varies from S/60 - S/80 without the entrance fee. Pros | The advantage is that you don't need to worry about transportation to and from the lake. Also, the price of the tour is reasonable because you share the cost with more people. Cons | What we see as a downside when traveling to Lake Paron with a tour is that you spend a long time on a bus without the hiking option. You will arrive at the same time with other minivans so you can't enjoy the place by yourself and you will also get to Laguna Paron around midday while the clearest views are in the morning (it, of course, depends on the weather). But as we already mentioned: if you decided to stay in Huaraz and visit the place from here, it is how it is, and there is not much you can do differently. Independently | To visit Laguna Paron independently, we recommend spending a night in Caraz (smaller, nicer and much closer town than Huaraz). The first (and the only 100% confirmed) collectivo to Pueblo Paron goes from the bus station near the market at 6:30 AM. It was not a van, but a standard car and if you are wondering how many people can fit into one car, it is nine. Here we also have to mention our experience with visitors center in Caraz. The lady who works there was very nice, but unfortunately, we asked her three questions, and she answered all three wrongly, so always ensure with locals from where the collectivo goes, what time it goes back and how much it cost. But back to the point. If you travel by public transport (S/10), it also means that you are going to hike to Laguna Paron because it will drop you off a few hundred meters from the gate. There are also taxis which can take you to the lake's shore and back with two hours waiting time for about S/120. To get from Caraz to the starting point of the hike takes an hour, in case you want to be driven right to the lake, it takes two hours. The collectivo dropped us off in Pueblo Paron, and we had to walk about five minutes to the starting point of the trek. The fun started when we wanted to get back from Pueblo Paron to Caraz. Pueblo Paron is not a village, but several scattered houses and the transport is irregular. In the info center, we were told that the last van goes at 1 PM, our morning driver informed us that the ultimate one goest at 4 PM, but when we finished our hike at 3 PM, the guy at the counter told us the last one would arrive at 7 PM. Well, after 20 kilometers in our legs, the idea of walking another 25 kilometers did not seem appealing, especially when it started to rain. But we had to get back before dark, so we walked down (and meanwhile unsuccessfully tried to hitchhike bypassing returning tour buses). After 3 kilometers, we spotted a car going in the opposite direction. The driver told us that he is going to Lake Paron to pick up some tourists and will drive them to Caraz. He agreed to take us - so we spend an hour in the car only to arrive at Laguna Paron again, where we picked up other passengers (the driver forgot to mention that it will be six of them plus us though) and in another two hours we arrived in Caraz. Pros | We always like to arrange things on own when possible. It is more adventurous (sometimes maybe more than we would prefer) and it gives us freedom. It is cheaper to get to Lake Paron independently (by public transport, not by taxi), you can hike to the lake which is demanding but satisfying, and also we reached the lake much earlier than tours from Huaraz and had time to take some awesome pics without crowds. Cons | Unambiguous disadvantage is the transport. Until now we don't know what time the collectivo goes back from Pueblo Paron to Caraz. Sometimes we even had a feeling that no one wants to tell us the true information only to persuade us to take a taxi. 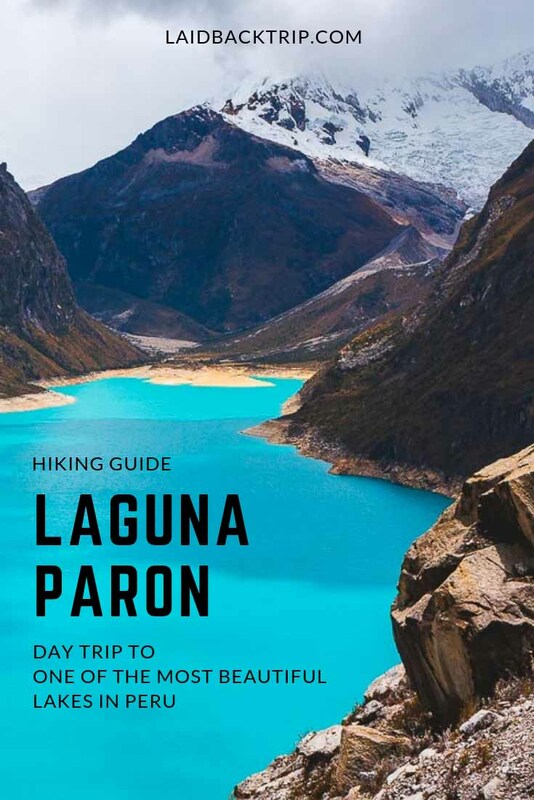 By car | Laguna Paron is easily accessible by car, so it is a perfect destination for those, who don't want to undergo the three hours long climb or simply for those who don't have enough time to do it. The parking lot is close to the lake's shore, so when driving, you can enjoy excellent views right you get off the car. Hike | There are two hiking trails to the lake. One follows a dirt road for cars and is longer the other one uses shortcuts and leads mostly through the forest and from time to time you must cross the road to another forested section. We chose this trail which is 10 kilometers long one way, you will gain 900 meters, and the hike takes 3 hours up and less than 2 hours to get down. Add another 45 minutes in case you would like to climb from the lake's shore to the Mirador. There's not much to do once you get to Laguna Paron except for enjoying stunning views and relaxing near the lake. Walk along the shore | You can walk along the lake's shore for some time, but it is not possible (or not advisable) to encircle the lake, as the trail on the left side of the lake suddenly disappears. A few people died here a couple years ago, so be careful. Mirador | To get even more spectacular views, you can climb to the viewpoint called Mirador. The path is clear and easy only the last section requires crossing a section with large boulders. The side hike takes about 45 minutes roundtrip plus about an hour (or more) to drink in the views and to have a snack. Camping | If you need more time to enjoy the scenery, you can camp for free near Lake Paron or spend a night in a basic shelter for S/10 per person. There is only a small shelter with toilet and benches where you can eat your snack. Locals sometimes sell some food and drinks near the lake, but it is not 100% guaranteed, better to take lunch with you.